WHEREAS the main access to most national parks is by automobile or by foot, the primary access to the 218,054-acre Voyageurs National Park is via water. Because Voyageurs NP lies to the west of the famous Boundary Waters Canoe Area Wilderness (BWCAW) in Minnesota, “the Land of 10,000 Lakes,” this peculiar feature should come as no surprise. Many people visited the park by canoe and kayak. These canoeists, kayakers, other boaters and fishermen found the park an aquatic haven. The (Sinhala-sounding) Kabetogama Peninsula, which lies entirely within the park and makes up most of its land area, is accessible only by boat. Others rented houseboats. Established as a national park in 1975, the Voyageurs (named after the French-Canadian fur traders) attracted an estimated 220,650 people in 2007. I’m going camping, yes sirree! I’m going camping, won’t you come with me? And camping we did go, covering a roundtrip driving distance of some 1,722 miles. We left Fargo-Moorhead at 8.30 a.m. and arrived at the Kabetogama Lake Visitor Center at 3.30 p.m. with stops at Mahnomen (pop. 2,052), Bemidji (pop. 13,419) and Blackduck (pop. 696). After driving 272 miles to reach Voyageurs NP, we parked our Toyota Camry wagon at the Kabetogama Lake Visitor Center because vehicles did not have access to the campgrounds. We set up tent at the Woodenfrog State Forest Campground (current site fee=$12 per night) to enjoy the park’s facilities for the next two days. We ate dinner seated around a campfire. The highlight of the evening was a program on water the park rangers presented at the interpretive center. In the morning, while Yoke-Sim and the two kids went to International Falls (pop. 12,000)””‚located northwest of the national park on the Rainy River directly across from Fort Frances, Ontario””‚to explore the Koochiching County Historical Museum, I joined a six-hour (10 a.m. to 4 p.m.) 50-mile roundtrip cruise on lakes Kabetogama and Namakan aboard the Betsy Anna with Dean Litwiller of Voyageur Park Lodge as the captain and tour guide. The highlights of the Litwiller cruise were the short stops at the Hoist Bay logging camp (in southwest Namakan Lake), and at the Mica Island’s abandoned mica mine (in the Namakan Narrows). Hoist Bay is named for the machinery used to hoist floating logs out of the lake. Mica Island got its name when two prospectors discovered a rich vein of mica on the island in 1895. I felt the 90-minute stop at the historic Kettle Falls Hotel was way too long. No roads lead to Kettle Falls. Ed Rose, a lumber baron, built the hotel, now a national historical marker, between 1910 and 1913 to accommodate assorted lumberjacks, gold prospectors, sportsmen and bootleggers. At the dam, I watched the water fall 10 ft. from Namakan Lake to Rainy Lake. However, the high degree of excitement I expected from this cruise did not materialize. The three eagle nests that I saw on three of the more than 200 islands dotting the lakes and a glimpse of the Ash River camping area were hardly sufficient to raise even a minor eye brow. Yoke-Sim and the kids also had joined a short afternoon (2 p.m. to 4.30 p.m.) cruise of the Rainy Lake at the Rainy Lake Visitor Center, located 12 miles (19 km) east of International Falls. They came to pick me up at the Kabetogama Lake Visitor Center, located on the southwestern edge of the park, at 5.30 p.m. (A third facility, the Ash River Visitor Center, is located on the southern boundary of the park.) The park encompasses the entire Lake Kabetogama and one-half the waters of the three lakes””‚Rainy, Namakan and Sandy Point””‚that straddle the Ontario-Minnesota boundary. This morning, we left the Woodenfrog campgrounds for International Falls, which still promoted itself as the “Icebox of the Nation” after Fraser, Colo., failed to substantiate in court its claim to be the superlative “Icebox.” The U.S. Patent and Trademark Office officially registered the slogan with International Falls on 29 Jan. 2008. Frostbite Falls, the fictional hometown of Squirrel and Moose in “The Rocky and Bullwinkle Show” of the early 1960s was a spoof of the real-life International Falls. We drove on the 11-mile stretch of SR 11 from the visitor center to the route’s eastern terminus at Island View on Rainy Lake to observe the northern bounds of the Voyageurs NP. On the way, we stopped at Ranier to see the City Beach. Yoke-Sim bought some wild rice and groceries at the International Mall to prepare dinner at the Zippel Bay State Park on the southeastern shore of the Lake of the Woods, 89 miles west of International Falls. Heavy rain in the afternoon and evening marred our exploratory instincts a great deal although we did stop at the Grand Mound Interpretive Center and walked on the trail to see the prehistoric Indian burial grounds. Bad weather also connived with twilight to prevent us from absorbing the scenic abundance the Lake of the Woods would have provided at sunset on a sunny day. We set up our tent in the Lakeview Campground, ate our (wild rice) dinner and planned our daring explorations for Sunday. We got up late this morning because rain had drained our energy. We left the state park about 10.30 a.m. after a walk along the magnificent Zippel Bay to replace some of the lost energy. Because my septuagenarian barber used to brag about his fishing exploits on Lake of the Woods, I had developed a craving to see this huge freshwater lake up close. It is more than 70 miles long and wide, and it accommodates more than 14,552 islands and 65,000 miles (105,000 km) of shoreline. The state of Minnesota (in the U.S.) and the provinces of Ontario and Manitoba (in Canada) shared the lake. We decided to rough it out by following a route closest to the southeastern shore of Lake of the Woods. To do so, we backtracked 20 miles to Baudette, crossed the Rainy River on the toll bridge ($1.45 in 1988) to Canada and headed another 38 miles north on ON””‚600N (via Harris Hill) and ON””‚621N (via Bergland) to Morson, from where one could see Lake of the Woods Provincial Park located on Bigsby and Dawson islands just a boat ride away. We ate lunch on the beach across the Birch Campground. We also went to see the day-users’ area of the campground before cruising in the vicinity to see more of the lake. Then, by chance, we ran into an Indian powwow at the Big Grassy Indian Reserve. Soon, we had to face the consequences of choosing to drive on unpaved dirt roads for the day’s explorations. We found common cause with an Ontario family who were driving behind us with a high noise level because the exhaust pipe of their car had come apart in the rough and tumble of negotiating bumpy roads. Thus, we felt ecstatic on reaching Trans-Canada 71, a very scenic highway winding along the eastern shore of Lake of the Woods from Caliper Lake (parallel to Morson), where I took over driving from Yoke-Sim. I stopped four miles north at the picturesque Nestor Falls to capture the storybook scenery. For the next 60 miles up to the Rushing River Provincial Park, which we reached at 7 p.m., Trans-Canada 71 snaked through the eastern edge of Lake of the Woods to mesmerize all of us with spectacular panoramas of the sunset. E=Voyageurs National Park (Red Arrow denotes Woodenfrog campground); F=Zippel Bay State Park in Williams, Minn.; G=Rushing River Provincial Park in Kenora, Ontario; H=Blue Lake Provincial Park in Dryden, Ontario; I=Kakabeka Provincial Park, west of Thunder Bay, Ontario; J=Pigeon River Provincial Park in Ontario. K=Burlington Bay Campground in Two Harbors, Minn.
A=Fargo-Moorhead; B=Mahnomen, Minn.; C=Bemidji, Minn.; D=Blackduck, Minn. 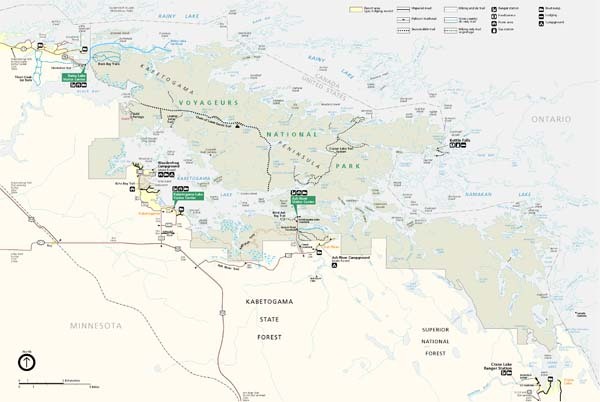 Figure 2: Enlarged Map of Voyageurs National Park. Kabetogama Peninsula””‚surrounded by Rainy Lake, Namakan Lake and Kabetogama Lake””‚is accessible only by water. This entry was posted on Saturday, December 18th, 2010. You can follow any responses to this entry through the RSS 2.0 feed. You can skip to the end and leave a response.